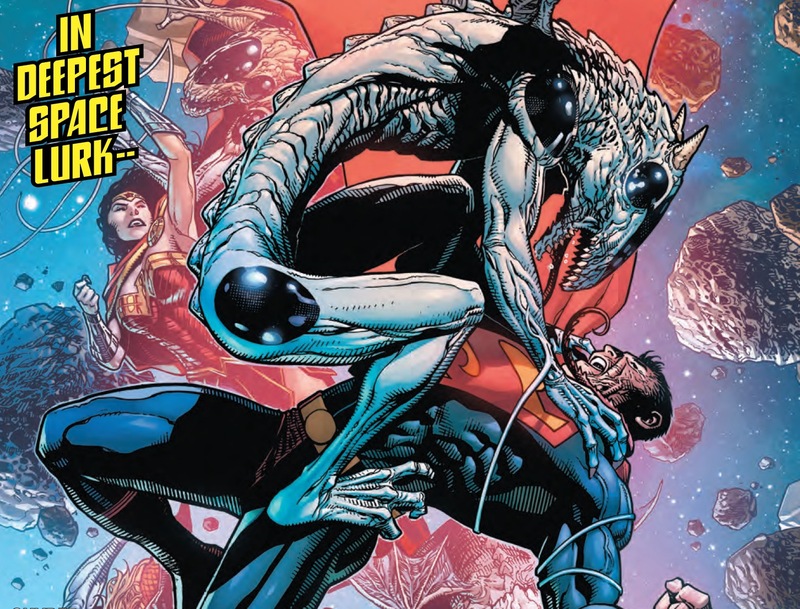 'Justice League' #9 review: A strong statement about the team and the Hall of Justice – AiPT! Learn more about the Hall of Justice and get an inside look at the Batman/Superman dynamic. The universe is saved once again and now the superheroes in the Hall of Justice are getting things in order. This is an issue that takes its time to reflect on the team as well delve into the relationship between Batman and Superman in interesting ways. Just another great team book from DC Comics, or is it more? THE ROAD TO “DROWNED EARTH”! Superman and Batman can’t agree on how to put back the moon–you know, the one that went missing in issue #1. On the other hand, Wonder Woman and Aquaman have faith in each other, working together on a new addition to the Hall of Justice. Martian Manhunter takes Hawkgirl under his wing to test out the limits of her recently broken wing, and Flash and Green Lantern get up to some hijinks in the Hall’s cafeteria. Can you say super food fight?! The latest take on Justice League has been a delightful experience we here at AiPT! have enjoyed immensely. This ninth issue begins to set in motion the second act so to speak to Scott Snyder and Jorge Jimenez’s great run. Also, spoilers, if you like Superman and Batman read this one. This issue has a vibe much like the Superman/Batman comics with its core focusing on the two communicating with each other. Superman is out in space smashing deadly aliens and Batman is in a hospital bed feeding him warnings and orders. Snyder has never defined his take on the Superman and Batman relationship quite as clearly as he does here. Superman is all positivity and optimism while Batman is a pessimist attempting to control every detail with gritted teeth. As the story progresses Snyder lets the two characters get into a bit of a back and forth which reveals their opposite sides quite well. By the end, there’s a lesson to be learned for them both and the team as a whole, giving the issue a nice backbone to rest other elements on. Much of the rest of this issue is much like one of the Legion of Doom issues earlier with a fun reveal of different rooms in the Hall of Justice. If you like comic book architecture and how superhero bases are set up you’re going to love what Jimenez and Snyder have cooked up for you. It’s equal parts enlightening and fun superhero stuff to see how Aquaman sets up his personal space, or how John Stewart is all function with his. I was expecting to get a laundry list, but Snyder writes it in a way that makes it conversational between two characters and it flows realistically. Jimenez captures so much fun and spirit in this issue in a variety of pages it’s hard to list them all. A favorite of mine is a double page layout of the cafeteria of the Hall of Justice which is littered with heroes of all rank and size. Wonder Woman always comes off as heroic and powerful while reserving a sense of calm and inspiration. It’s wonderful stuff. Jimenez is also very good at showing energy in his fight scenes. There’s a sense of kinetic thrill that keeps your interest. I had some trouble understanding the very last page of the book. After re-reading it three times and talking it over with my girlfriend, I think I get the point and it’s an honest and good one. That said, it shouldn’t be that hard to understand, right? I think what throws me off is how Batman and Superman’s back and forth doesn’t quite follow the path to the final most logical point being made. Especially with Batman iterating something about a bat-moon, but I digress. Once I figured it out it’s a very nice moment indeed. A great issue that gives Batman and Superman ample time to say and do things (who were underused in the last few chapters). This issue drives home very strong points about the team and how different philosophical approaches help build a better one. Snyder has said he’ll continue this series well into 50 issues, which is a good thing for all comic book readers. This issue drives home very strong points about the team and how different philosophical approaches help build a better one. Snyder has said he’ll continue this series well into 50 issues, which is a good thing for all comic book readers.